Thomas O. Paine was NASA's third Administrator during whose term of office the first seven Apollo manned missions were flown, including the first two to the Moon's surface. Paine graduated from Brown University in 1942 with an A.B. degree in engineering and in 1947 from Stanford University with a Ph.D. in metallurgy. In World War II he served as a submarine officer in the Pacific. Subsequently, he held a variety of research and research-management positions before being appointed Deputy Administrator of NASA in 1968. 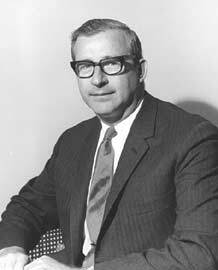 Upon the retirement of James Webb, Paine was named Acting Administrator and nominated as Administrator of NASA in March 1969, a position from which he resigned in September 1970, to return to the General Electric. In 1985 the White House chose Thomas Paine as chair of a National Commission on Space to prepare a report on the future of space exploration. Since leaving NASA 15 years earlier, Paine had been a tireless spokesman for an expansive view of what should be done in space. The Paine Commission took almost a year to prepare its report, largely because it solicited public input in hearings throughout the United States. The Commission report, Pioneering the Space Frontier, published in May 1986, espoused "a pioneering mission for 21st-century America – to lead the exploration and development of the space frontier, advancing science, technology, and enterprise, and building institutions and systems that make accessible vast new resources and support human settlements beyond Earth orbit, from the highlands of the Moon to the plains of Mars." The report also contained a "Declaration for Space" that included a rationale for exploring and settling the Solar System and outlined a long-range space program for the United States.